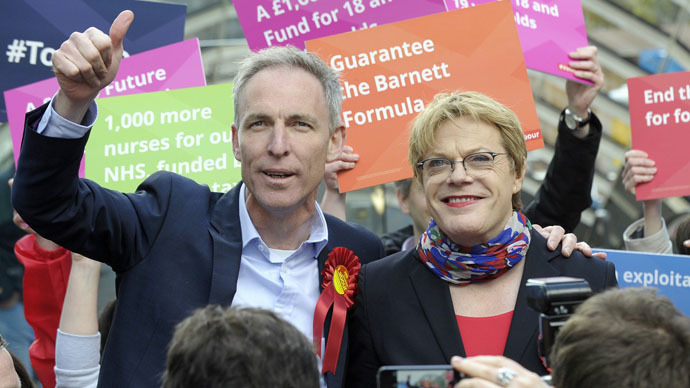 Scottish Labour Party leader Jim Murphy and comedian Eddie Izzard were forced to flee Glasgow after being confronted by ‘violent’ protesters during a turbulent election rally. Izzard is a Labour supporter who teamed up with the party’s Scottish leader, Murphy, to tell voters to back Labour in order to keep the Tories out. When they both reached the rally to speak, they were cut off by protestors who used megaphones and loud music from sound systems to drown out their speeches. The “aggressive” chants came shortly after nationalists shoved a cardboard banner in Murphy’s face. Scuffles broke out in the crowd between activists and party members, and a six-year-old girl was carried out in tears. Many others in the crowd, including an STV reporter, were pushed to the ground in the ensuing confusion. The scuffles left Murphy and Izzard with no choice but to flee the scene and abandon their planned interviews with the media. He told BBC news the event details had been passed to him by a dissatisfied Labour Party supporter. Political tension is running high in Scotland in the run up to Thursday’s election, as resent polls indicate the SNP will beat Labour in every Scottish constituency. Murphy, who was “disgusted” by what happened, told STV news “this sort of aggressive nationalism” should have no place in the election. “This isn’t the type of Scotland we want. Scotland, the Labour Party and the people of Scotland are much better than this sort of aggressive nationalism,” he added. “This aggressive, this violent emotion, why violence?” he said. “Don’t have violence, we should just put our point of view forward and then everyone makes their choice on Thursday. “This is democracy, it’s all about voting. They should let the democratic process happen, it’s called democracy,” he added. The SNP denied any involvement in the protest, despite SNP members handing out leaflets at the event. According to CNN, they were not involved in the fracas. Protesters told me they are not SNP members but "people of Glasgow" and "working class activists"
Jim Murphy said "we will deal with co-operation with the SNP after the election ". Clarified to repeat no deals line.